That’s what I think whenever I contemplate the funding system we use for providing services for individuals with cognitive, developmental, and intellectual disabilities. Medicaid is the primary program in the United States for funding residential programs in the United States. Depending on the state, the federal government shares 50% to approximately 78% of the cost of these services. The part of Medicaid that serves (poorly, as you will see) as the baseline funding mechanism for adults with developmental disabilities is designed to provide care in what are known as Intermediate Care Facilities (ICFs). Medicaid’s ICF program was enacted in 1971 and generally funded large public and private congregate and institutional settings. Very quickly it became evident that this was a bad approach to providing services. Study after study demonstrated that for the vast majority of consumers, services offered in community settings were more efficient and effective, and became recognized as “best practice.” I think most of us in the field would also agree that providing services in the community is a mutually beneficial system where the consumer and the community both win. Furthermore, ICF funding was shown to be inflexible in addressing needs that are non-medical in nature. As a reaction to the obvious shortcomings of the ICF program, in 1981 Congress passed a law which authorized the Secretary of Health and Human Services to grant Home and Community Based (HCBS) Waivers to support services to people with developmental disabilities who were at risk of institutionalization. The result of this action should not be surprising. The waiver programs grew exponentially (by 1990, there were 150 waiver programs across the country) and have now become the primary source of financial support for services and supports for individuals with intellectual disabilities. 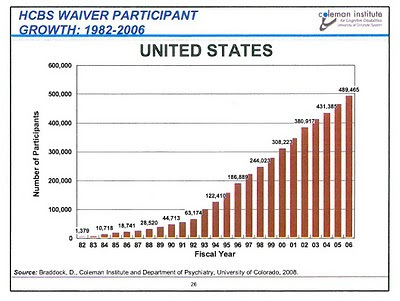 Take a look at the chart below to see the growth of waiver participants since 1982. 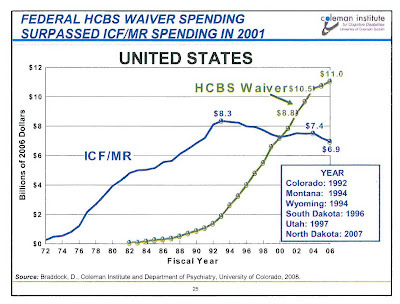 And a little less than a decade ago, HCBS waiver spending surpassed ICF spending. So this is a good thing, right? Well, from a services standpoint, yes. More and more people get their services in a natural environment. But from a funding standpoint, the waiver system leaves much to be desired. Why? Because by their very definition, waivers are considered to be “exceptions” to the baseline ICF program. So they tend to be created and implemented in a bit of a vacuum – addressing a singular issue or a few small issues with little regard to taking a more universal view to services. Rules and regulations differ from waiver to waiver, creating a bureaucratic nightmare that is difficult for even seasoned professionals to navigate, to say nothing of the effects on the end-user. There is no cohesion. The system of funding we have now revolves around all the “exceptions,” which, when looked out in total, actually make them the “rule.” The logic to the system is lost when the exception becomes the rule. The waivers are designed to prevent institutionalization, while the ICF program they are “waiving” is designed to encourage institutionalization. It is completely backwards and incredibly inefficient. Considering the desperate need for services facing our nation, and the equally desperate lack of resources to provide those services, the funding system needs to be overhauled from the top down. In a blog post last week, I discussed the need for those of us in the DD field to collaborate with the academic community to find answers to the myriad problems we are facing. I think an academic study looking at new ways of funding services in our field, taking a comprehensive view and using community based services as the baseline would pay dividends now and well into the future. OK, I like where you are going. Good post. thoughtful. if we made the bulk of host home services the "norm", a lot of regulatory overlap and administrative costs could fall by the wayside. Here in Colorado, it seems DDD is on an ever expanding road to including ICF-type things and then when the cost goes UP institutionalization looks "good" again froma fiscal standpoint. So much for raising the life span years of persons with DD.Hypocritical,eh? The problem is that the foundations of services are theoretically weak and until there is a vastly different oreintation to how we conceptualize the provision of services at a fundamental level we will continue to get these same variations on a theme. Perhaps instead of decry's about how funding is not right, we could take a more useful approach and ask ourselves why the current system is right. Once we understand why we have a perfect system then we can work on improving it. Thank you all for the comments. I will take this good thinking and incorporate it into our effort to influence a better future.